Finding peace hasn’t always been easy for Singh, who was told by a palm reader that she would die by the age of five. “My mother believed I wouldn’t live every time I was ill,” she said. But Singh always felt she had a guardian angel, whom she called on frequently. One of the biggest tests came at age 8, when Singh and her sisters were sent away during India’s struggle for independence. Because their father was a high-ranking government official, their mother felt they would be safer at a boarding school. But a teacher at the school was abusing young girls and Singh staged a nonviolent protest, much like Gandhi, himself, would have done. “I sat in the temple and prayed, ‘My God, somebody has to come from Delhi and get us or I’m not going to eat.’” Soon her prayers were answered and she and her sisters returned home. Singh’s next big test came at age 16, not long after India had won freedom from British rule. She married an Indian prince from Rajasthan state. What initially attracted Singh to her husband was his rebellious character, which made him run away to Rabindranath Tagore’s University and join the struggle for independence. “When I met him, he had just returned from a demonstration and looked wonderfully fired up. It was love at first sight!” They soon moved out of the palace and into their own place in Edinburgh and then London, where her husband earned his bachelor’s and master’s degrees and eventually a Ph.D. at the London School of Economics. Instead, she had to pursue her college education over a period of 27 years, through the untimely death of her husband and the subsequent marriage to his mentor, noted political science professor Bertram Myron Gross. Gross passed away in 1997 and Singh continued teaching Gandhian ethics and theory at Saint Mary’s College until her retirement last spring. 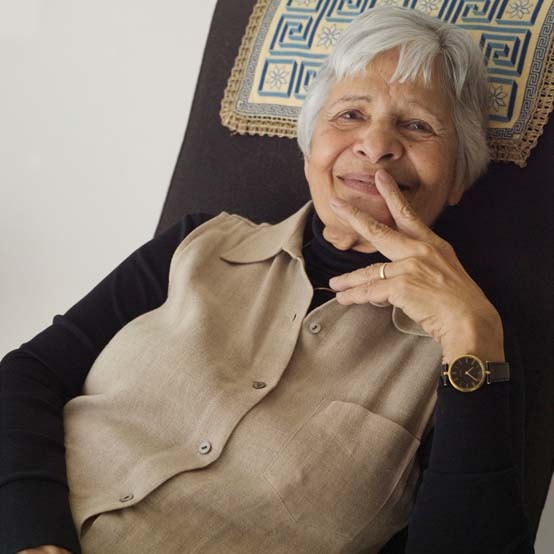 Looking back, Singh sees stages that could only have occurred through divine intervention — like her meeting with Gandhi at the age of 2; her life as the bride of an Indian prince; her marriage to Gross and her ongoing study of Gandhi’s legacy, including a Fulbright Fellowship in 1991 and 2002. Today, Singh looks forward to splitting her time between Moraga and India, where she’ll work as a resident scholar and write her memoir “From Purdah to Ph.D.: A Life Shaped by Gandhi.” Never far from her side will be her guardian angel, who, no doubt, will guide her through this next stage of life. This is a fantastic article! I had the opportunity to learn under Professor Singh in her communication theory class. Thanks for writing this, Ginny!